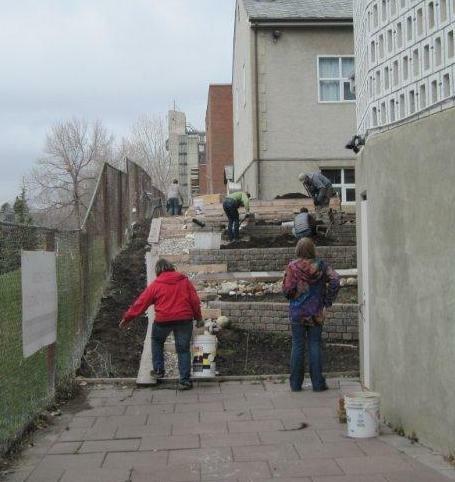 April 20 Workday a Success – Thank You, Everyone! Despite the chilly weather and grey skies, we had a great turnout on our first workday of 2013. We moved 4 cubic yards of compost into the beds, set up our water barrels, and got a good start on come construction projects. Thank you to some of our St. Barnabas friends who provided treats to go with our tea & coffee. Our next workday is coming up quickly. It will be this Saturday, April 27th. The committee will send out another email letting you know what’s on the agenda. Please remember that you do need to attend at least one workday as part of your garden membership, or you need to send someone in your place.